What is a SANDEN heat pump? There are many different ways of heating your domestic hot water. Most common are the instant gas, solar hot water with a gas or electric booster and conventional electric. Heat pumps work like split systems utilising the energy in the ambient air. While this sounds inefficient, the SANDEN heat pump is achieving a coefficient of performance (COP) of 5 (1kWh of electricity in 4.5-5kWh of hot water out). This means the SANDEN heat pump has an efficiency of about 500% in comparison with instant gas which has an efficiency of about 75-85%. The SANDEN uses on average 2.5-3.0kWh per day verses conventional electric ones using 15-20kWh per day. 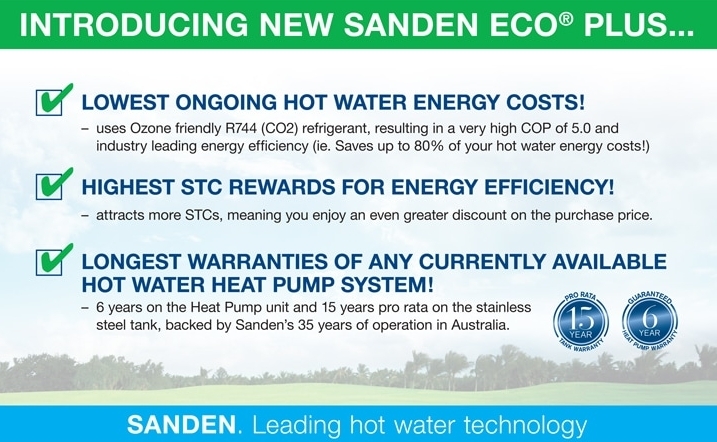 Why choose the SANDEN heat pump? With so many different heat pumps available on the market, the whisper quiet SANDEN runs at a sound pressure level of 37db - That is less than a fridge! Whereas other brands go up to 60db. With an average runtime of just 2.5 hours per day compared to others with up to 8 hours. As you can imagine the SANDEN is not cheap but surprisingly it cost less than a solar hot water system. Combined with a solar system on your roof you will never again pay for heating your hot water as the energy comes straight from your roof. Click here to download the SANDEN brochure or contact us for a customised quote.